Cerbera Gallery features an interesting selection of Judy Ling Wong works. Buy online or visit us in the Kansas City Crossroads for more contemporary art. London-based, Judy was born in Hong Kong in 1949. She became a professional Chinese traditional painter at the age of 12. Mastering the skills of calligraphy and the carving of signature seals in 1977, she became the first woman in the history of China to be Master of the 3 Arts. To read the fascinating story of how she has integrated East West concepts in her work, read the article “Art Perfecting Itself” in the section News. 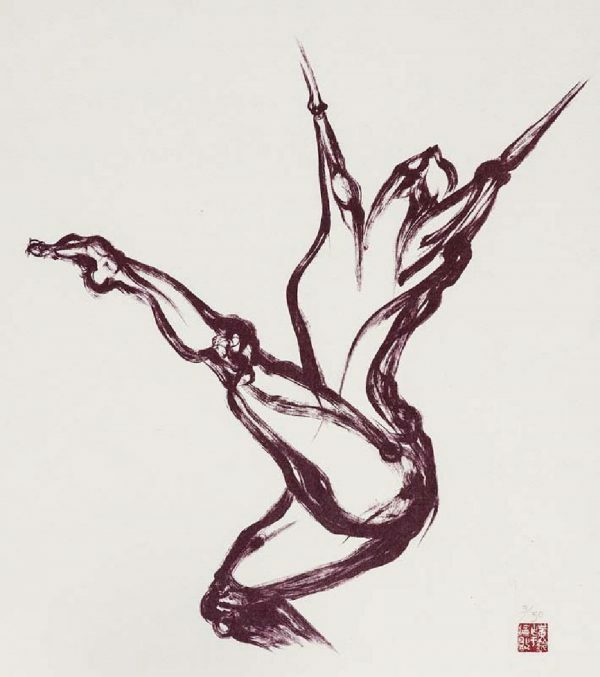 Judy Ling Wong uses Chinese traditional techniques and a range of Western techniques including printmaking. Chinese art is anchored in the spiritual vocabulary of nature. Artisitic expression is deemed to be contained in the flow and surge of the meandering line. The use of space recognises the power of the empty space as equal to the space occupied by line and image. Strongly influenced by the French tradition of Livres d’artiste (Artists’ Books), Judy has adopted the use of this art form, in which the coming together of images and poems are akin to the Chinese tradition of combining painting and poetic phrases. “Long Summer” published by The Whittington Press in 1977, with etchings and poems handset in Caslon, in a limited edition of 50, was included in the list of “The 100 Most Beautiful Books in Britain” by the National Book Leaque. It is now over 10 times its original price at over £800. The luxurious finely crafted leather-bound volumes of Harlequinade, with an edition of only 20, are now worth over £6000 each. Judy Ling Wong is a vision caster and a major voice on policy towards social inclusion. Over the years, her contribution has included membership of the DCMS Historic Environment Executive Committee, ODPM Urban Green Spaces Task Force, National Trust Council for England and Wales, Wales Assembly Government Environmental Strategy Reference Group, Scottish Museums Council National Access and Learning Steering Group, and the IUCN/WCPA Urban Specialist Group. The complexity of Judy’s involvement with the arts and her devotion to society has resulted in a rich and complex journey.